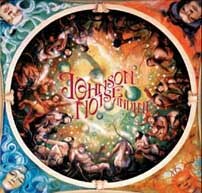 This is the latest release by the power rock trio, Johnson Noise. It was recorded back in 1999 and only released now. The beautiful gatefold LP features some nice artwork and 3 songs on each side. Side A starts with the heavy rocker, Soundwaves, with some great wah guitar workouts! Next is 2 long songs, Virtual Reality (11:41) and Undine’s Sister (10:44). Virtual Reality starts slow with some echoed blues-noise guitar and a slow slumbering bass line. After 3 minutes or so the song takes a dramatic shift and becomes a heavy foot stomping number and later they just freakout, only to return to the heavy foot stomping riff again. Cool song. Undine’s Sister is an instrumental jam piece with multilayered guitars that give it a really psychedelic flavour. Side B begins with Aquarius Blues and some really tortured guitar playing and a guitar freakout. Dark Days is also sort of a tortured song in a way. The LP ends with a very cool reworking of Trouble Everyday by the Mothers of Invention. Nasoni and Johnson Noise have delivered another cool record for the fans.